Sun Tzu The Art of War. III Attack by Stratagem 18.Hence the saying: If you know the enemy and know yourself; you need not fear the result of a hundred battles. If you know yourself but not the enemy, for every victory gained you will also suffer a defeat. If you know neither the enemy nor yourself, you will succumb in every battle. We know ourselves. But history has proven effectively that we do not know our enemy. We keep making the same mistakes and not learning from them. This is why the Middle East is in turmoil and will remain so until we actually learn to understand. When James Foley was on his knees, he became the symbol for every American. From the way he was dressed, to his lack of hair, to the way he was killed was all a deliberate act of contempt against America and a demonstration of not only how ISIS sees us, but how they intend to treat us. The murder of James Foley was a declaration of unlimited warfare. The color orange is a modern day version of saffron, which to Islam is the color of non-believers clothing. Islamic men are warned never to wear saffron-colored clothing for this reason. We of the West chose orange for prison jump suits. We chose it for the ability to readily see and therefore making it difficult for a prisoner to hide; two messages in one. Did you see? Did you understand? James was dressed in the colors of the unbeliever. If you did not understand that, you failed to understand your enemy. He was on his knees to represent the subjugation of the non-believers by the Faithful. His head was shaved. We might see this as a psychological, identification, or health reason. In Islam, a shaven head is only permissible by the faithful at very specific times. Otherwise, a shaven head is to humiliate and subjugate. Again, we see Islam standing over a humiliated America. He was shaved. A beard is an item of beauty in Islam. It lends credibility, it gives honor, it attests to wisdom and faithfulness. If you could ask a SOF operator why they had a beard, part of the reason was the mere fact that having one gave them more credibility. By not allowing a beard, they again stated that James was less than they, was without wisdom, was unjust and worthy only of death as they see all in the West who do not wear beards. A beard was the gift of Allah to Adam. Denying the right to a beard denies the right to Allah. One would have to know what to look for to see that the declarations had been cast before the first cut was made. This is not a simple matter and it is not something that is going to go away. His executioner was dressed in black, but several other objects were readily apparent. He was wearing a shoulder holster, which is typical of Western Forces. U.S. forces in Iraq and Afghanistan who carried pistols while on base popularized this style of holster. The executioner is wearing Western style desert boots and his accent is from England. If you think any of this is coincidence you do not know your enemy. Those three characteristics tell us that this man is a member of the Western society or wants to appear that way. He says he is among us and will walk beside us and we will never know he is there. The act of execution itself is another message. In Islam, it is still permissible to execute criminals by beheading. However, this is usually completed with a sword. To use a small knife is to show contempt to your captive. Foley was not worth more than a knife because he was less than an animal. James Foley was not executed — he was slaughtered like a farm animal and was given just as much dignity. His killer would have no concern over the suffering of a goat dispatched this way and showed us he had no concern over a fellow human being because a goat deserves no remorse in how it’s killed. The knife was in the left hand. The left hand is unclean in Islam and thus, again they degrade their victim by stating he was unclean and therefore worth nothing. Killed with no more regard than that of a farm animal, but using the left hand to send the clear message that Foley was unclean. It was to state that this death was so pointless that it has no meaning. The placement of the body and the head is also symbolic. The holiest site in Islam is Mecca. Observing the shadows cast on his face in the video and the likelihood it happened in the morning, James was facing Mecca being judged. But his body was laid perpendicular to Mecca and his head faced left. Again, this shows contempt for those without faith. In that one short video showcasing the brutal death of an innocent man, the Islamic State sent a plethora of contemptuous messages. Everything symbolized, implied and carried-out in that video was there for a very specific reason. It was as carefully choreographed as any Hollywood production or Broadway play. It was a message designed to whip up a frenzy of emotion and retribution. It was also designed to show the power of ISIS in their conquest of Syria and Northern Iraq. Why use someone with a readily identifiable British accent? They wanted to show that ISIS accepts anyone to high positions of responsibility to the cause regardless of their native-born country. ISIS is showing that they are equal opportunity employers in the most graphic way possible. They intend to show that not only do they fight on the battlefield, but exhibit that their influence can reach anywhere. They are not only known in the West, they have adherents from the West. In short, they are saying that they know us better than we know them. Unfortunately, this seems to be true especially in the White House. Americans have a major weakness that many do not even realize. We try and fix things and make things better. We tend to let our ideals get in the way of common sense on occasion and make things worse than they needed to be, but we usually have a good heart about what we are doing. Not this time. This time there is no fixing this. There is no possibility of negotiation and there is no realistic method of dealing with ISIS short of direct engagement. Americans get in trouble around the world because they refuse to understand that other cultures have different rules. This is one of those times. ISIS has demonstrated that they hold us in contempt. They have murdered a man with no more consideration than they would give a goat, then compound the insult by using the unclean hand — showing even less value to human life than that of a goat. Every step of the process was deliberately orchestrated to show absolute contempt and their power. If we fail to recognize and understand those things at a national level, we are going to pay a bloody price for it. We cannot negotiate with these people and anyone who thinks we can is a fool. We must meet them on the field of battle and root them out where they hide. But most importantly, we must do this properly because we understand our enemy. They fear us. They do not fear warplanes. They fear warriors on the ground hunting them. They fear the American Soldier who will not stop until their enemy has been destroyed. That fear is real. They learned all about it in Iraq and Afghanistan. We need to remove the idiotic Rules of Engagement that cause us more problems and cost us our Soldier’s lives. Understand this, we need to stop treating Islamists as if there will ever be peace that does not come from the sword. We do not need to destroy Islam in order to eliminate their threat, but we need to show them that two can play the brutal, efficient killer game and that we are far better at it. We need them afraid to awaken our wrath. Only then will we have peace, for they will find accommodation with us and we will never reach one with them. The only thing Islamists fear is power. We must unleash our power and send good men and women to crush our enemies. The only rules of engagement — comply or die. Then they will fear and they will stop. 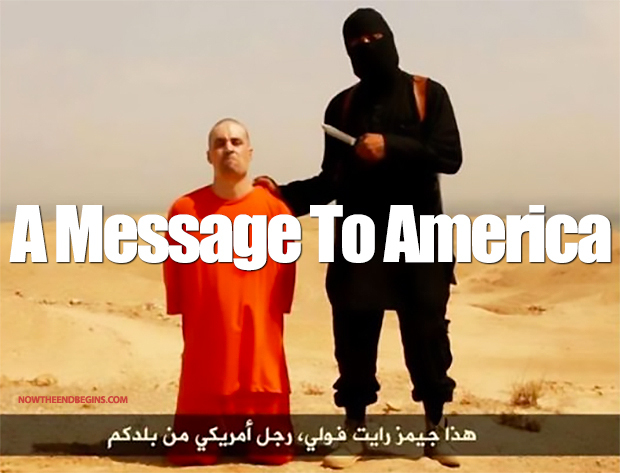 The message they sent us was a declaration of war written in James Foley’s blood. It is time we understood that.